For thicker bars, you can instead bake this recipe in a greased 9 by 13 inch pan; the bars will take about 5 minutes longer to bake. Preheat oven to 350 degrees. Grease a 12 by 18 inch rimmed baking sheet and line with parchment paper or foil. Scrape into the prepared pan and spread into an even layer with a spatula. Bake 20 to 25 minutes until lightly browned and firm, and a knife inserted in the center comes out clean. Let cool then cut into shapes or bars. (If using a cookie cutter to cut shapes, trim the excess from around each shape and use a pancake turner to lift the shape from the pan.) 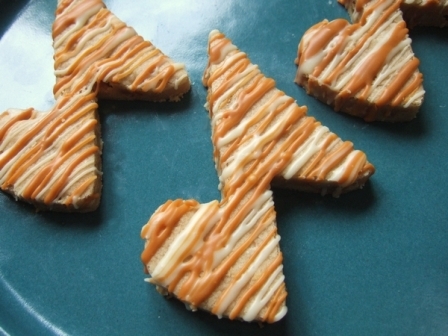 Drizzle with melted white chocolate and/or butterscotch chips, if desired, and serve.